I like to read over the Sunday Readings prior to Mass and then just listen during Mass. Sometimes what sticks out when I read it is completely different than when I listen. That was the case today. When I read over the Gospel (John 15:3-8) what stuck out was ...ask for whatever you want and it will be done for you. (John 15:7). So...all we have to do is ask & it will be given? That sounds a little deceiving because God won't give us all we ask for. We ask and He will do what is best for us. But He does want us to ask. Maybe in asking and not receiving what we ask for He is allowing us to hand over control to Him; to hand over our trust in Him. 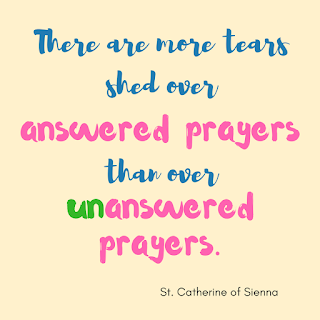 So many times I prayed for something only to have something else given to me. Then I realize that what I received was so much better than what I asked for. 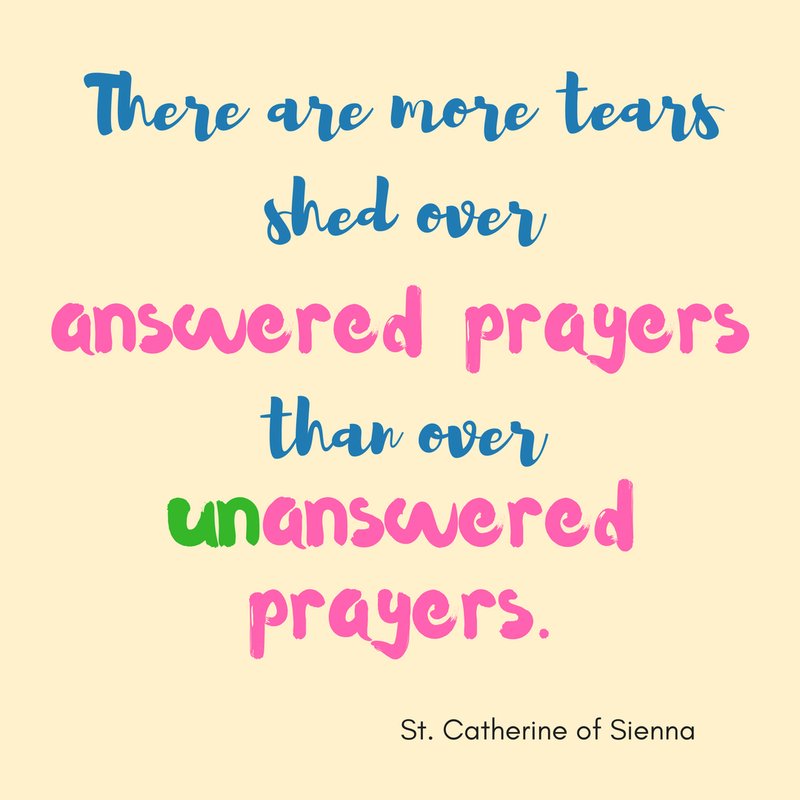 Today is the feast day of St. Catherine of Sienna. The quote "If you are what you should be, you will set the whole world ablaze" popped up a bunch at one point in my life. It came at a time I desperately needed to hear that. I looked around for other quotes, and the one above jumped out at me. Isn't that so true? We have to be careful what we ask for. That was initially what stuck with me, but it changed during Mass. When the little ones came up for children's liturgy, Father mentioned that the vine takes the nourishment to the branches. In the Gospel, Jesus says that he is the vine, we are the branches. We receive our nourishment from Him. During the 1st Reading (Acts 9:26-31), Saul wasn't allowed to die. He was nurtured (it was more like a quick IV, actually!) so that he could bring life to others. The show "A.D. Kingdom and Empire" (Netflix) follows the Acts of the Apostles; it really brought Saul to life. You can see what a horrible man he was and how he changed. You can see the apostles thinking it was a hoax, and you can see Barnabas taking up for him. Pretty powerful stuff! The Second Reading (1John 3:18-24) reminds us to love one another. Father spoke about coming to Mass only to find someone else has taken your pew. I know that happened to me a couple of times before I joined the contemporary choir, and it really gets your day off to a bad start. Father compared that to the branch of a tree dying; it's not pretty. He suggested that instead of becoming angry, we show love to that person by introducing ourselves and asking they are new. (That got a few laughs from the congregation.) It's definitely something to think about the next time it happens. So now the Gospel. Back to the vine and the branches. Jesus offers nourishment every single day. Prayer, scripture studies, or just sitting provide the opportunity to nourish our souls. It's our choice whether to take it and live or wither and die. Pope Francis said, "There can be no place of deceit, hypocrisy, or small-mindedness if we are branches." We need nourishment. We can't be too proud to say yes to the Lord. It's okay to lean on Him; it's the only way we're going to achieve our goal: to get to heaven. Great post. I particularly enjoyed our conversation before I headed to Mass this morning. I look at the conversion of Saul a little differently, though. Saul wasn't a horrible man, he was a rabbinic scholar and religious zealot for sure. He committed horrible acts, not the least of which was the murder of the first martyr, Stephen. He believed his actions were in the name of God and for Judaism. I wonder if Saul's heart felt the stirrings of the Holy Spirit and if it was his resistance that led to the systematic persecution of the believers? It seems he had just the kind of temperament God needed to spread the good news to the young church! He was unrelenting and just as zealous for Christ! I've never thought of Saul that way, but I see it now!